Situated on 8 acres high atop a beautifully wooded area is where you will find Zoerenity Chalet. At Zoerenity Chalet you will lose yourself in the rustic beauty coupled with top of the line luxury of a high end spa. Our property provides the perfect accommodations for your vacation getaway. 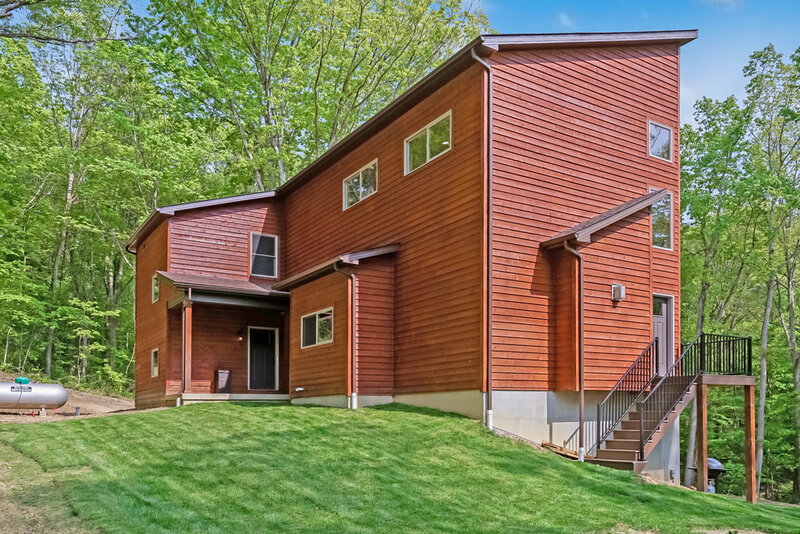 Whether your visit to Hocking Hills is for a special occasion, a couples getaway, a weekend retreat or some time with the family, Zoerenity Chalet will soon become your escape from everyday life. Large open space living room with a wall full of picturesque custom windows looking out to a majestically beautiful tree lined view. Bringing your family? The living room provides two memory foam queen size leather sofa sleepers. Gas log fireplace built inside 25 feet of beautiful Autumn Blend limestone wall. With a 55 inch flat screen tv and dvd player. Play your own music when you connect to the state of the art bluetooth soundbar. Beautiful custom walnut dining table sits in a comfy nook with a serene view. 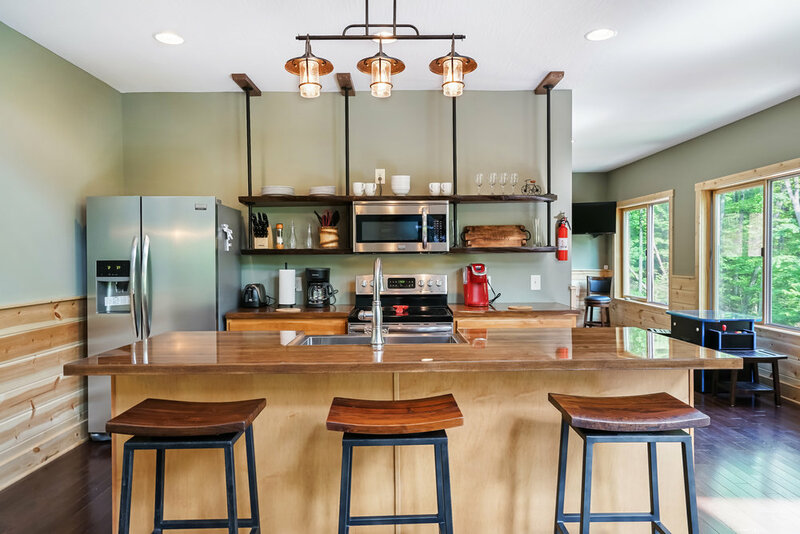 Modern fully stocked kitchen with stainless steel appliances, large farm sink, beautiful butcher block counter tops and custom live edge kitchen shelves. The game room features a 40 inch tv. Pool Table, Electronic Dart board, Extra Large Wood Dominoes, Extra Large Wood Jenga blocks and a 60 game multicade cocktail table. Loft bedroom has a 55 inch tv and a king size bed with a premium mattress and opens up to a spa like bathroom with a luxurious 6 x 9 tile shower offering 2 rainfall shower heads and wand body sprayer. Warm your towel on our premium towel warmer. Bedroom also has french doors that open up to a cozy balcony with a majestic view of the amazing tree tops and the bright clear sky. 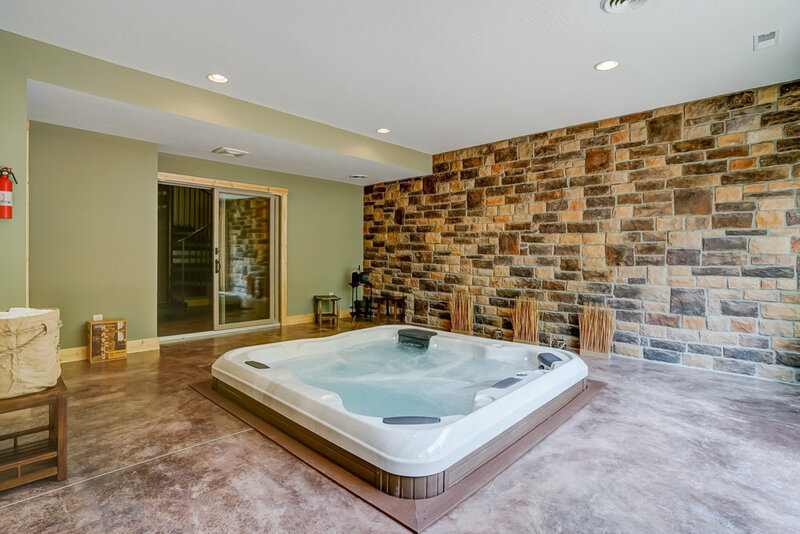 Look out the wall of glass sliders while you Soak in the 6 person indoor sunken hot tub. 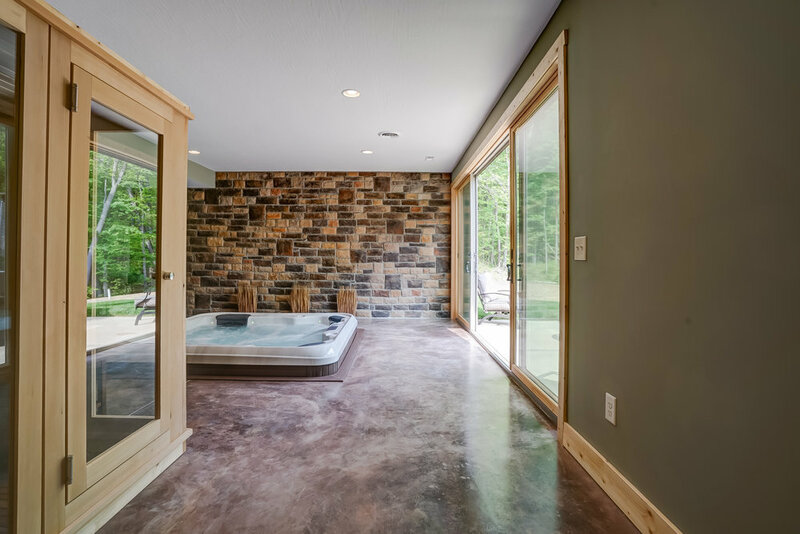 Relax in the 4 person cedar real steam heat sauna. Lounge outside around a romantic fire pit dining set and increase the ambiance when you light up the night with stainless steel infrared torch lamps. Prepare your dinner on our gas & charcoal combination grill. Sleeps up to 8 with an additional bedroom available but it’s a sweet secret. Ask us how, but be sure to keep our secret.